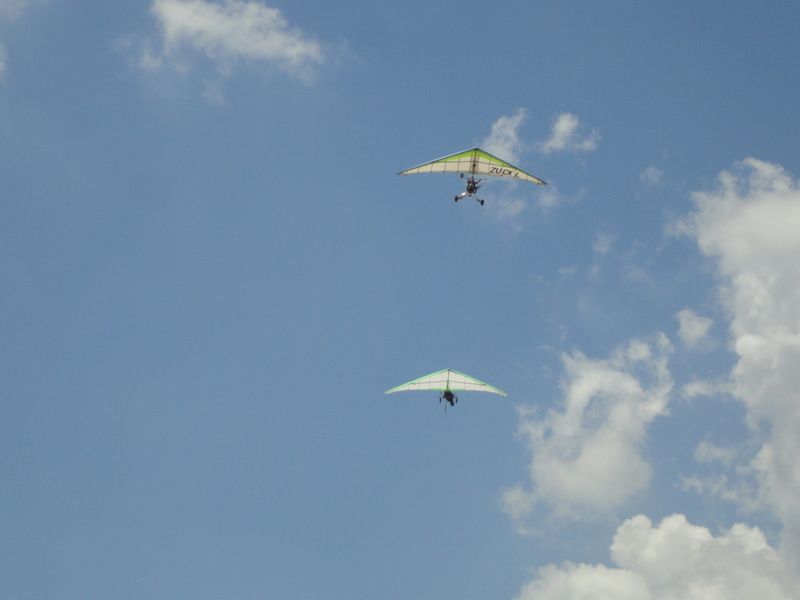 A couple of weeks back I went hang gliding for the first time. My wife had been itching to do adventure sports, so I surprised her by booking a tandem hang gliding session on a random Sunday morning. 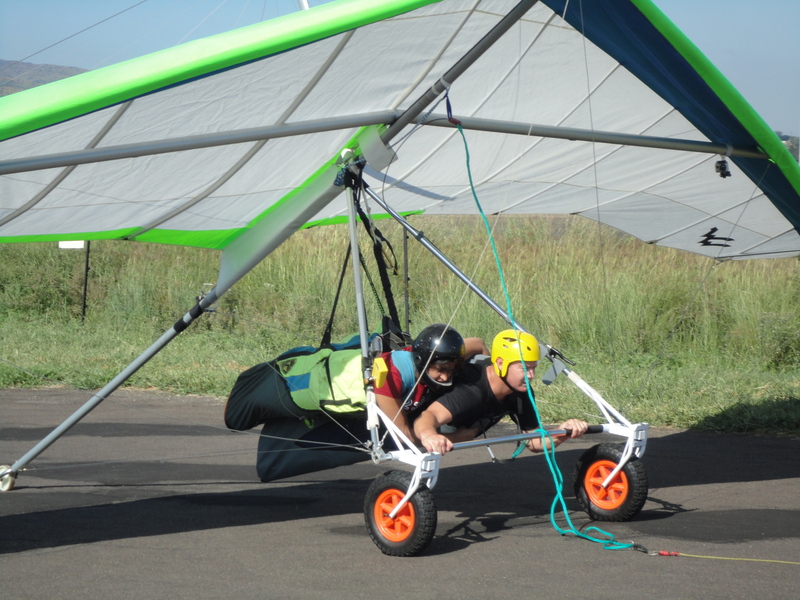 Tandem hang gliding is basically introductory hang gliding where you physically hold on to an instructor as you hang-glide and the instructor does all the work like maneuvering, ascending, descending and landing. Normally from what I have heard, people jump off a mountain in order to hang-glide but here we took off from a small runway. A microlight or small plane engine with a glider frame was connected by rope to our glider. 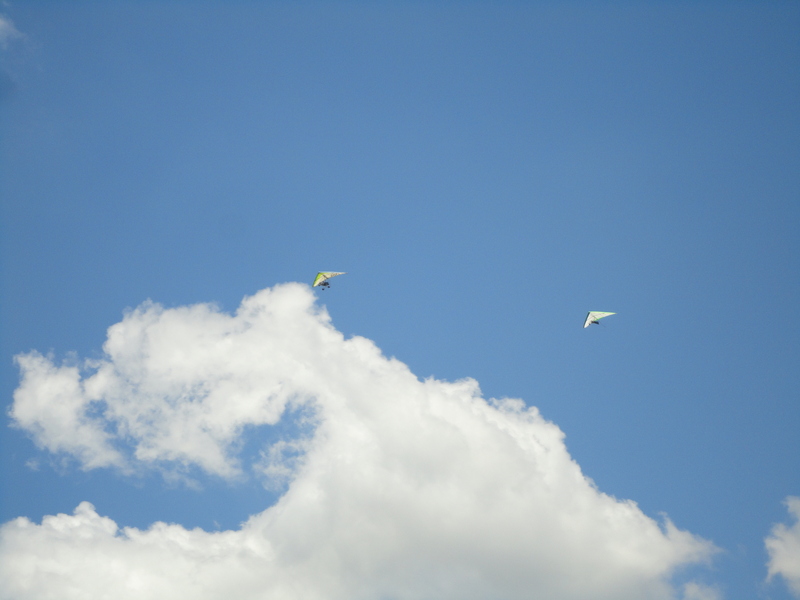 As the pilot of the microlight accelerated and took off, we were also lifted up into the air. It seemed like an easier or at least less intimidating way to go up rather than simply jumping off a cliff over jagged rocks below. Once we were all the way up and started coasting at a certain height, the instructor released the rope. 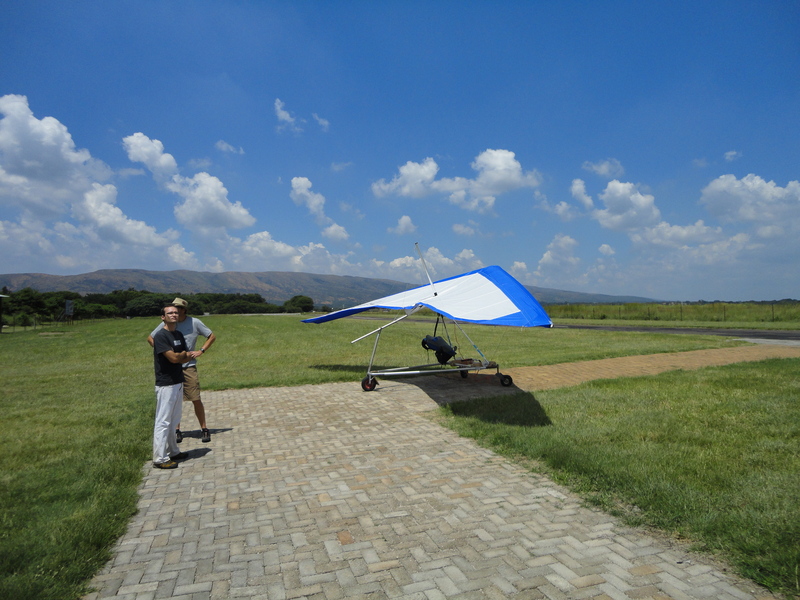 From that point on, our instructor had full control of the glider. The microlight then prepared to land so that the pilot could help other people take off. 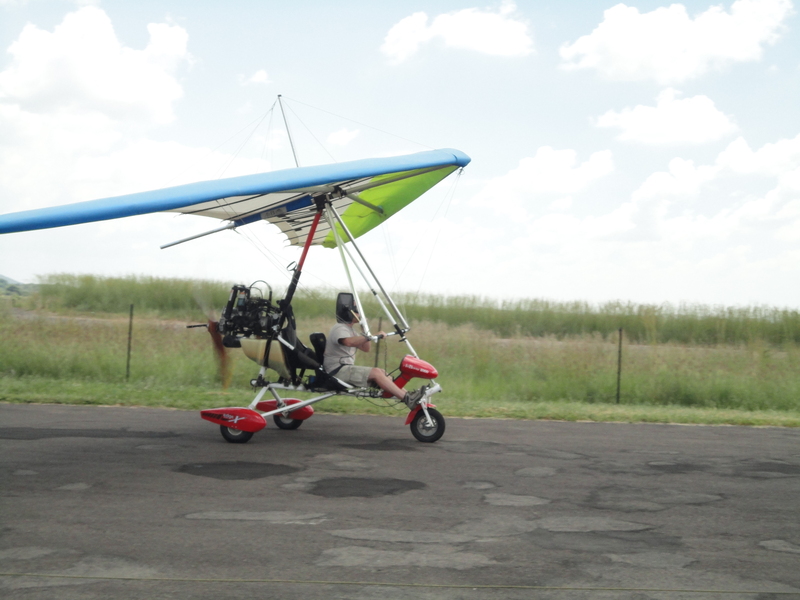 The place where we did this was called Aviator’s Paradise and it is near Hartbeespoort dam and the Magaliesburg mountain range. So the scenery from up above was absolutely stunning! Several evenly ploughed, beautiful, circular fields started coming into view as we made the ascent, along with gorgeous views of mountains, lakes and white clouds against the azure sky. The instructor had an altitude meter attached to one end of the glider and he periodically glanced at it in order to gauge our position and maneuver accordingly. He had also attached these small, very hi-tech, shock resistant cameras to each end of the glider, so as to capture the whole flight on video. The video was included in the price of the flight. That was nice. The feeling that we got from this experience was nothing short of exhilarating, but something happened which neither I nor my wife expected. We both started feeling incredibly queasy and almost on the verge of throwing up as we reached about 800 metres. So we both had to tell the instructor to quickly start making the descent lest we start vomiting from the heavens! See, actually what happened was that our flights got delayed because of excessive wind early in the morning. 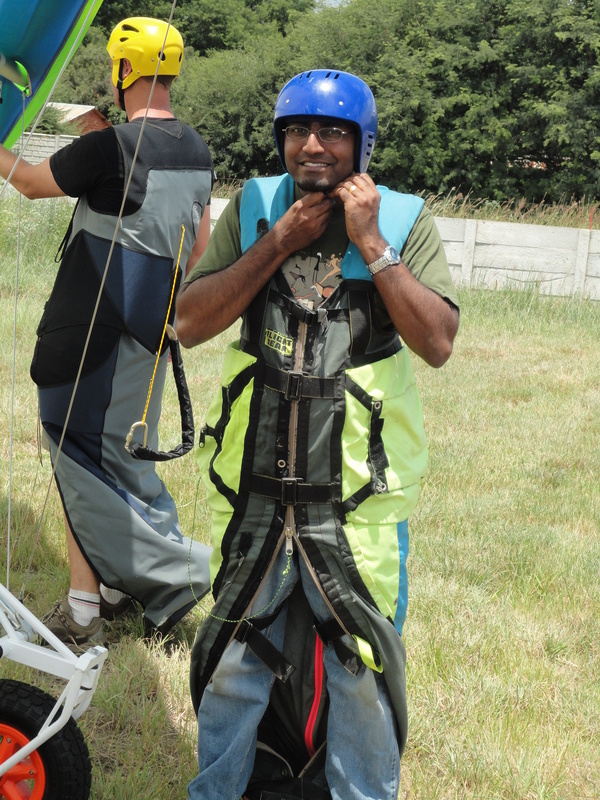 The instructor was not comfortable doing the flight with so much wind blowing in a particular direction. So we had to wait. He told us to go get breakfast in the meantime and come back in an hour or two. So we went and had a nice breakfast of pancakes and coffee. We were indeed conscious about the fact that it may cause queasiness in the flight. So, after eating we left a gap of around an hour or so before flying. But apparently it wasn’t enough. Hence it is very important for any curious people out there who want to try hang gliding: Don’t eat anything! Or eat very little… maybe a muesli bar or something, just to satisfy that bit of hunger in the morning. Otherwise, it really does take away something special from the whole experience because as soon as you go up, you feel like you want to come back down again. Anyway, it was awesome fun to do it and I would surely do it again… only with hardly any food in the belly!